A couple of weeks ago I saw a wonderful exhibition on Kaffe Fassett's work at a National Trust house. 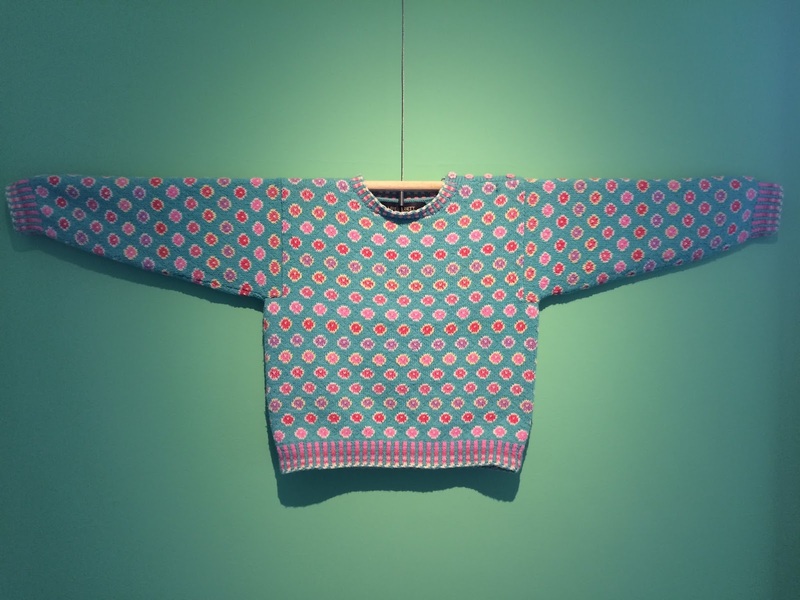 The rooms displayed mainly quilts, but also knitwear and embroidery using the designers stunning fabrics and patterns. 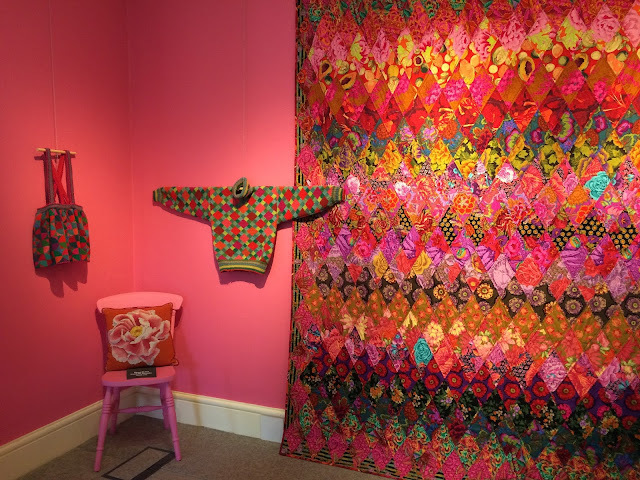 It was one of the most vivid and colourful exhibitions I've ever seen, the fabric are absolutely stunning! I was also very much in awe at the intricate embroideries. I managed to take a few photos, but I would definitely recommend seeing his work in real life if you ever have the opportunity, the colours are simply impossible to captivate! I thought that the set-up of the exhibition was really well done. There were four rooms that you could walk through, and each was colour-coded, which I really liked. The walls were painted either green, pink, blue or yellow and the creations inside the room matched the colours of the walls. 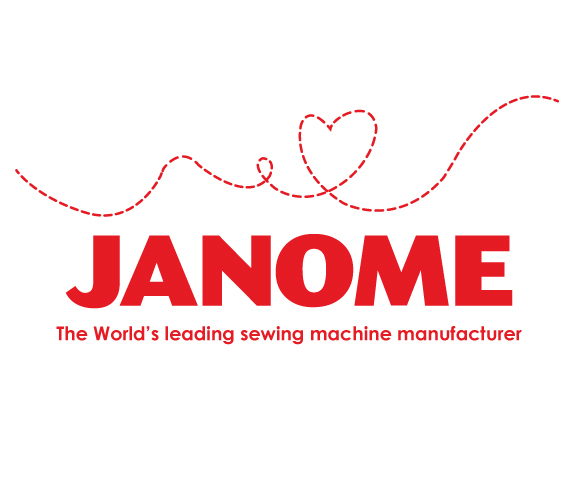 I don't have any photos of the designer's classic white and blue colour scheme, but you can find more photos of each of the fabrics on his website. 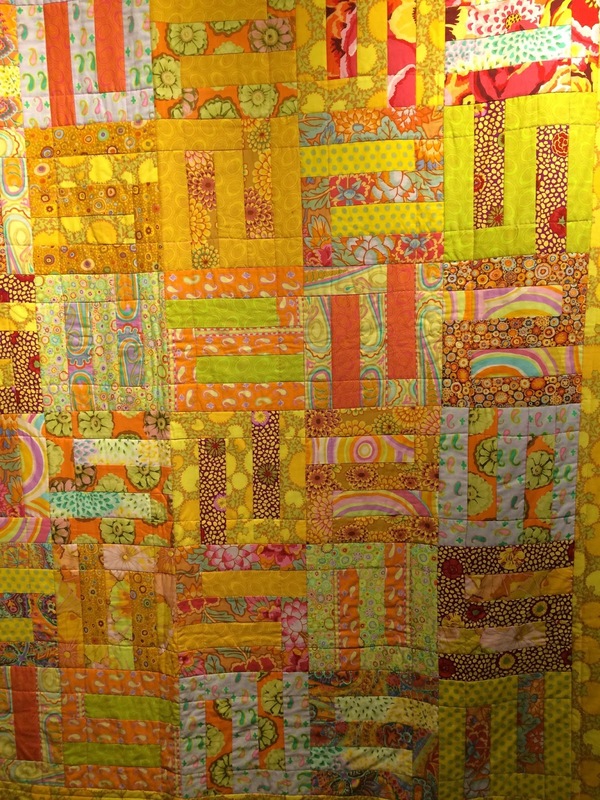 Above is a photograph of a quilt which was in the 'yellow room', made from lots of really vivid prints, perfect for Easter. The bright colours didn't match the grey weather outside, so it was nice to imagine being in summer after seeing the quilts! The pink and blue rooms were my favourite. While I always veer towards cooler colours in dressmaking, I love how bright pinks can look in a quilt. The one above caught my attention because of the stunning fussy cutting of the flowers. The black frame reminds me of a film. 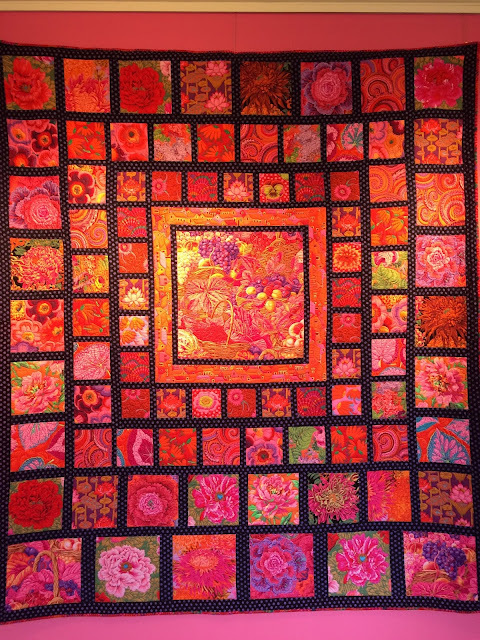 It isn't visible on the photo, but each flower is intricately hand quilted around the outline, giving the quilt a very lovely 3D and more realistic effect. 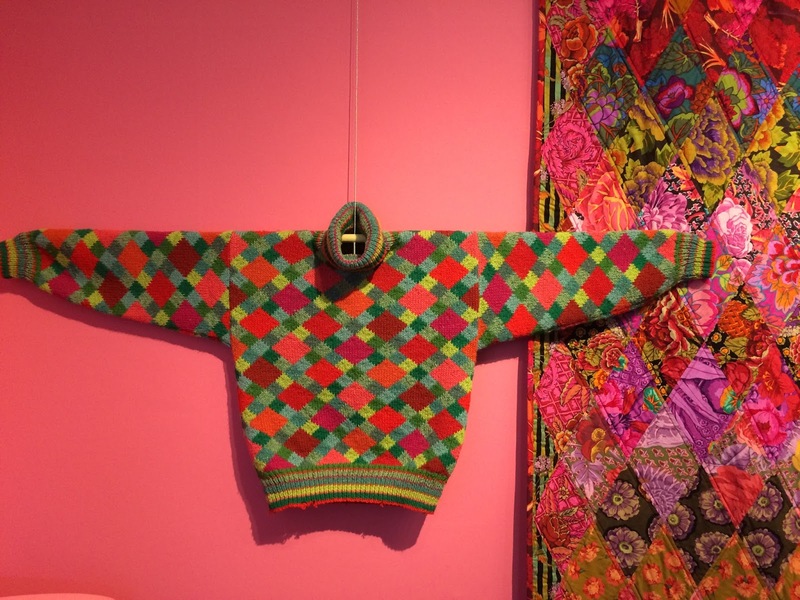 I enjoyed looking at the knitwear as well as the quilts. I still plan on knitting a jumper someday, but for now I will just admire knitted clothes from afar! I think that this pattern in particular is lovely, and the colours are so strong. I like the quilt it's hanging next to too, the fabrics look stunning together. On the subject of knitwear, here is another jumper made from one of Kaffe Fassett's designs. Again, I think that the intricacy of the pattern is incredible, it doesn't seem possible that someone was able to knit such a detailed design! The embroidery completely took my breath away, not just how difficult the designs seem, but also the scale of it! 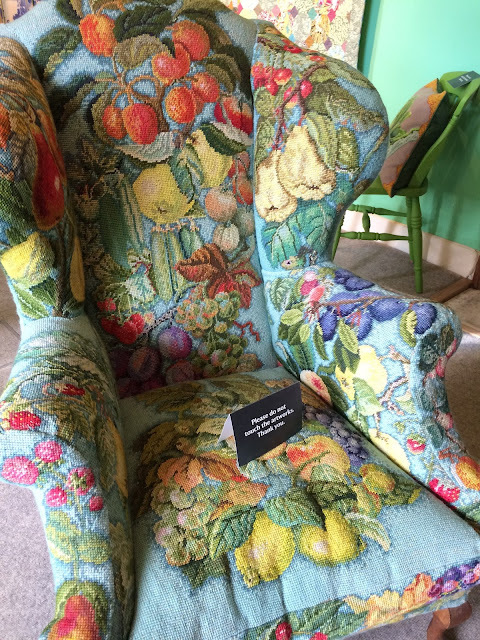 Just imagine how long it must have taken to embroider the fabric for this chair. 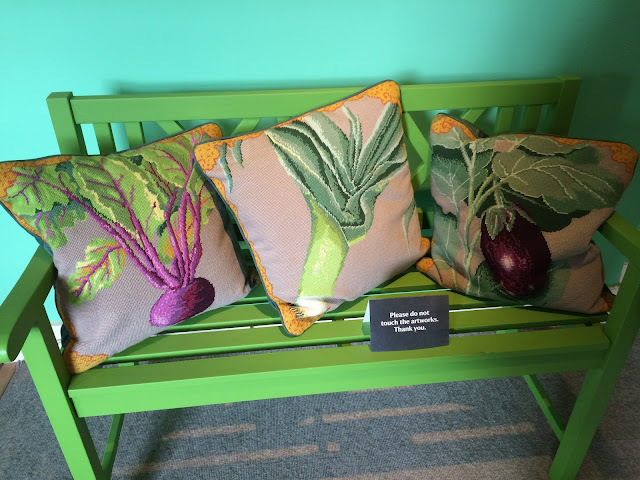 There were a lot of links to produce in the 'green room', including a whole embroidered quilt as well as some cushions. I personally love these, and had it been more affordable would have bought the kit to make one! I love the colours of the purple and green, and the vegetables just look so realistic. It was really interesting wandering around the rooms, as each contained something slightly different. It was truly a wonderful exhibition, and I would love to either do an embroidery of one of Kaffe Fassett's designs or make a quilt out of some of the stunning fabrics. And who knows, maybe one day I'll be able to knit one of his jumper patterns?! This would be an exhibit to spend some time with!